It is rhubarb season, indeed. Have I ever seen rhubarb before and known what it was? Nope. Have I ever eaten rhubarb before? Nope. Did I get it in the first week of our CSA? Yep. Did I bake it into a delicious crumble? Yep. Alec and I signed up for a half farm share this summer. We are only on week 3 out of 22 and I absolutely love it. So far we have received 2 bushels of apples, 2 quarts of fresh strawberries, zucchini and yellow summer squash, three bags of peas, 6 heads of various types of lettuce, radishes, garlic scapes, a basil plant and rhubarb. Did you know you can eat radish greens? Me either, but now I do. You can bet your bottom dollar they are in our fresh made salad this week, too. Anyway, having a farm share has been (and is going to be) a wonderful experience for a young foodie like me. I am learning so much about different types of fruits and vegetables, what to do with them, how to store them, how to cut them...etc. I'll share any exciting knowledge on here with all of you because I have a feeling this journey into food-knowledge is something that deserves to be chronicled. So, to begin, let's talk about rhubarb. 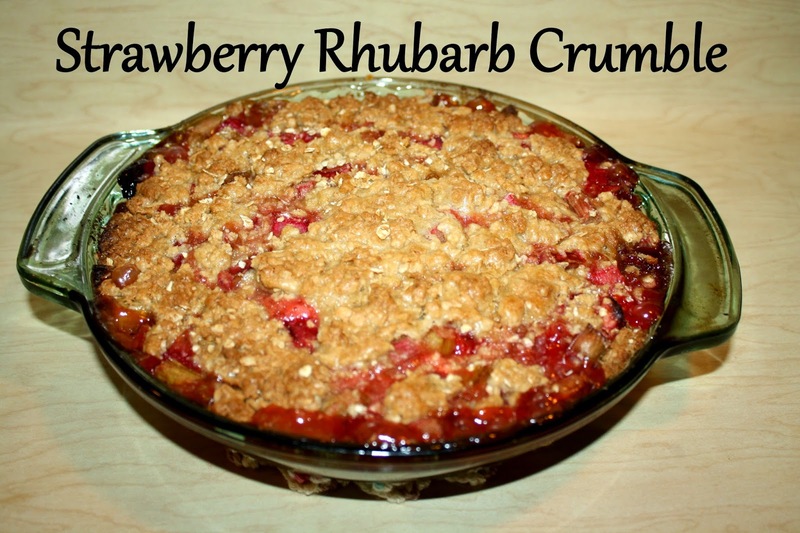 This recipe is a great way to meet rhubarb. It is sweet, fresh and is similar to the familiar apple crisp we all love. Why not start with what we know, right? Rhubarb is somewhat bitter and looks like red celery. You don't have to pull the strings out like with celery or peel it. You can use the green part and the red part. I thought you might have to trim off the green part and only eat the red portion, but that is simply untrue. Clean your rhubarb, cut off the ends of your stalks and chop up the rest for your crumble. Since rhubarb is notorious for it's bitter side, I added in just a few strawberries to add a little extra sweetness. Mostly because I knew my dad would ask me if I added strawberries and would be more likely to try it if I answered with "yes." Spoiler alert: He didn't end up trying it. 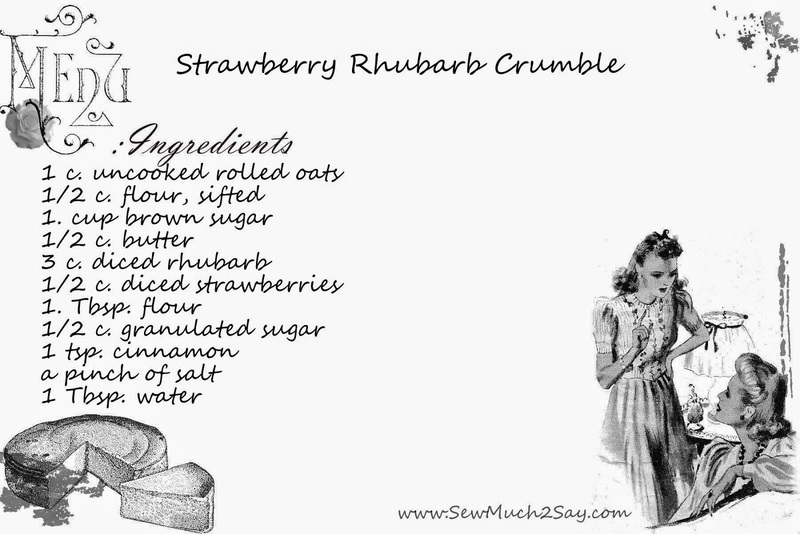 Next, follow the recipe cards above to create your strawberry rhubarb filling. Stir it all together so the rhubarb is well coated. Then, combine the oats, flour, brown sugar and butter listed above to create the crumble mixture. It should be..well....crumbly. Use half of the crumble mixture to coat the bottom of your dish. I used a pie dish because that is all I had that would fit the amount of rhubarb I used. 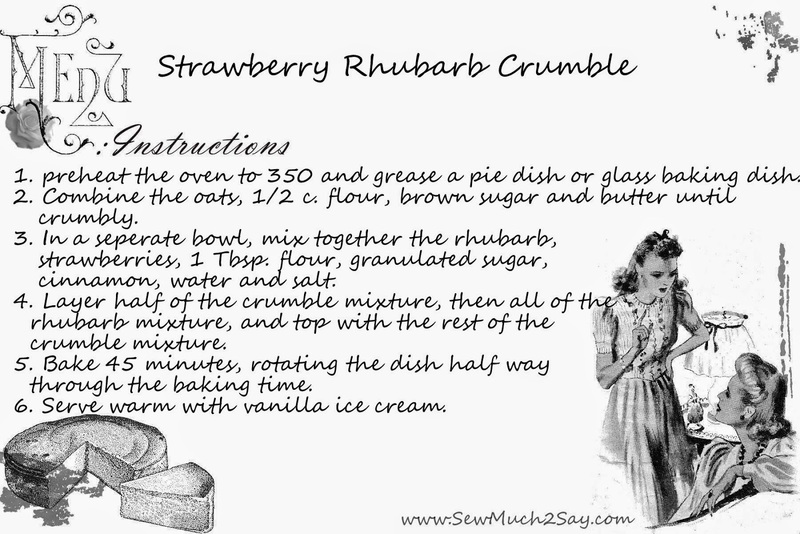 Then, layer all of the strawberry rhubarb mixture into the middle. Top evenly with the rest of the crumble. Don't worry about smoothing it down or anything, just try to make sure the crumble is evenly distributed. All you have left to do is stick it in the oven for about 45 minutes and enjoy the smells wafting through your home. When it is finished cooking, serve it warm with a scoop of vanilla ice cream for optimal enjoyment. Then, push it on your friends and family so that you don't eat the entire dish yourself. I made it for my best friend Kacie and I to enjoy when she came over after she heard about my engagement. Then, I brought it to my mom's house where my mother, my brother's girlfriend and I ate it out of the dish with spoons. It's that good.